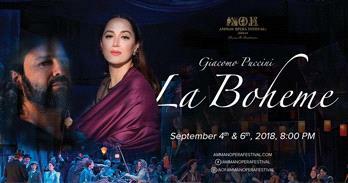 The Second edition of the Amman Opera Festival will include a full production of La Boheme by Italian composer Giacomo Puccini on 4,6 September, This epic performance will take place at the 2000-year-old Roman Theater in Amman. Purchase your tickets before 15th of AUGUST and get early bird 10% discount. Come early and enjoy the activities and snacks at the Piazza. Part of the proceeds go to scholarship and the benefit of underprivileged children.